Your surgery will be performed in a modern equipped operating theatre in a hospital. In most cases you will only need to spend a morning or afternoon in the hospital, after which you will be able to go home. 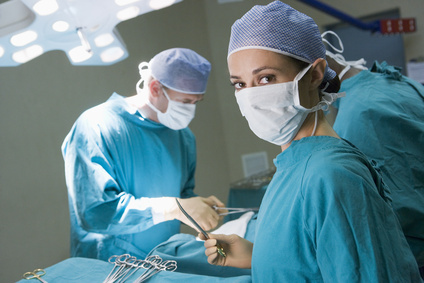 You will have a choice of the type of anaesthetic used for your surgery, although the majority of hand and wrist surgery can be performed using local anaesthetic techniques. These are safer than a general anaesthetic, they provide good postoperative analgesia and do not have the common side effects of drowsiness, nausea or a sore throat. Whether you decide to have a regional or general anaesthetic, it will be administered by a consultant anaesthetist. It is normal to not to eat for 6 hours before a general or regional anaesthetic, but you can drink clear fluids until two hours beforehand.There are no restricition on eating and drinking if the operation is performed using a local anaesthetic. Your surgery will be performed by Mr Farnell with the help of a fully trained team of nurses and other allied healthcare professionals. In the operating theatre a screen will be put up so you do not see the actual operation and this will remain for the duration of surgery. You are welcome to bring your ipod or MP3 player to listen to music during the operation if this makes you more comfortable and relaxed. Many people are understandably apprehensive or even frightened of having surgery - I was the same when I had my operation. Most of this is due to a fear of the unknown and generally people expect the worst. After surgery most patients describe the experience as nowhere as bad as they had expected and in hindsight feel that they worried unnecessarily. They usually have few reservations about returning for surgery on the other hand. If you are concerned about your surgery you should speak to your surgeon who will be able to address this with you.